Today we had a lazy and crafty day, two of my favorite things in the world! I'm coming up with some new felt hairpiece designs, pretty exciting! I figured out a way to make the shapes I cut all turn out the same, it's working really well! I don't have the money for a die-cut machine, so this system is the next best thing, I guess! I started AND finished a painting today, and I'm really really excited about it! I haven't painted in a long time, and especially not something that I didn't want to instantly burn. I think I might be taking this lemon thing a little too far though, I'm getting a little obsessed! 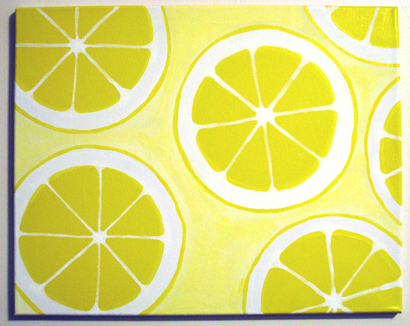 In my dream last night I was wearing the cutest little lemon print dress! UGH! I finally have a painting of my own to hang in our apartment! 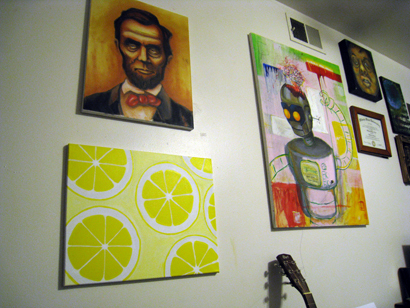 Literally every wall in our apartment has at least two paintings on it. Chris is a little nutso with them. He uses the spare bedroom as his studio room (which has always made me jealous! ), but on top of that he insists on hanging his finished and near-finished paintings on the walls in the living room, that way he can pick them apart and figure out what else he needs to do to them. It's a good thing I like his paintings, and that I don't have any problem telling him when I don't like something! 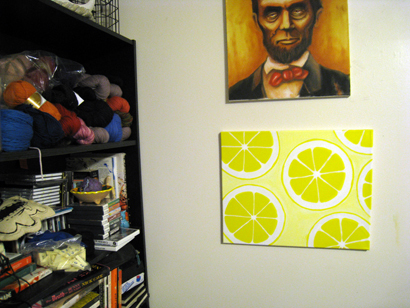 I think I'm going to try to wrangle his paintings into our craft room in the new house, except for a few of my faves. I want to be able to decorate, you know? Not just have his art everywhere. That sounds worse than I mean... Whoops! I love your painting - yellow is my fav colour! Love your blog - thanks for your comment.